Many people find the thought of moving a freezer overwhelming. It’s actually quite simple as long as you follow some basic steps. Moving Freezer Empty or Full? In an ideal world you would always have an empty freezer come moving day, but sometimes that just doesn’t happen. The last time I moved we had just stocked up the freezer not even a month before we decided to move. The opportunity came and we took it so we had to move with a full freezer. No cats were harmed in the taking of this picture. He moved when melted ice started dripping on his head. 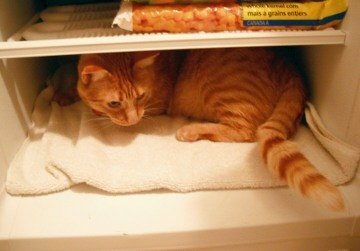 Please, do not move your freezer with your cat inside. Fill it to the max. This helps keep everything frozen for longer. I freeze my condiments and dairy so that I know they won’t get to warm and go bad during the move. Ice is great for filling the freezer cheap, just make sure it’s in a sealed container in case it does start to thaw. Put a towel at the bottom of the freezer in case anything starts to defrost and drip. Don't worry my cat got cold and moved before we repacked everything in the freezer. Pack smart in case things thaw. Things that won’t drip on top such as breads, baked goods and pastas, next things that won’t kill you if their juices contaminate other foods like fruits, vegetables and broths. Then cooked meats and at the very bottom raw meats and seafood. Consider how your moving the freezer while packing it. Will it be on it’s side in the moving truck or on the dolly moving into the new place? If so you should open and check the freezer contents before bringing in into your new place. If your moving a full freezer make it the last thing to go into the truck and the first thing out of the truck to reduce the time it’s unplugged and keep your food safe. Look at the calendar. A full freezer that remains unopened should be fine for one or two days, by the third day it may start defrosting. Anything longer than that and you probably shouldn’t move with a full freezer. Wait until the last minute to unplug it. Seal the door before unplugging and don‘t open the door your ready to plug it back in. 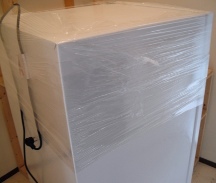 There is no need to defrost the freezer if your moving with it full and there is not a lot of ice build up. However if your moving with an empty freezer you should defrost the freezer and clean the inside before moving. Learn how to defrost freezer. Will it fit through the doorways? If in doubt measure the doorways and hallways you’ll need to move the freezer though. Doors can be taken off the hinges to give a little bit of extra space. Remember it got there somehow and it can leave the same way. If space is really tight the door of the freezer can be removed. Unplug and kept the cord safe. You don’t want to trip on it and you don’t want it to get damaged. Tape the cord to the freezer with duck tape or package tape if your moving an empty freezer. If your moving a full freezer adjust the cord at the same time as sealing the door. You can use tape or plastic wrap to seal the door. This step is optional if your moving an empty freezer but absolutely essential if your moving a full freezer. If it has straps use them. In my experience it’s easiest to have two people work on moving something as heavy and bulky as a freezer. When we moved we put the strongest person on the dolly and the weaker person as a guide and assistant in the front. This really helped when it came to navigating stairs. If your using a moving truck such as a Uhaul use the loading ramp. It’s much easier than trying to lift something as heavy as a freezer, particularly a full freezer from the ground up to your waist. This might mean you have to unhook and rehook up an auto-transport. It’s worth it! Save your back. Make sure the bolt on the auto transport is fully loosened and unhook the chains. There are directions online and on the auto transport units. If there isn’t a ramp leave the freezer on the dolly and have one person get in the truck or moving vehicle and pull while another person on the ground lifts. Place the back of the dolly against the truck and tip the dolly at a 45 degree angle so your using leverage as well as strength. Older freezers had to sit for 12-24 hours before being turned on, many people also claim that waiting is a good idea if the freezer has been on its side or back. I’m not an appliance expert and the best advice I can give is to google or call the manufacture and ask them if your not sure about waiting to plug in your freezer. I did not wait to plug in mine after moving and it still works fine. I have a newer Kenmore upright freezer. But the risk is yours so if your unsure do your homework. Also check the freezer contents before replugging to make sure the food is at a safe temperature and that nothing has been contaminated. 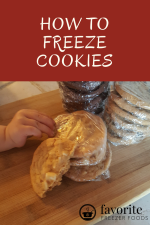 Learn more about freezer cooking. Return from Moving Freezer to the homepage of Favorite Freezer Foods. 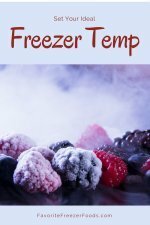 For more freezer tips and techniques sign up for the Favorite Freezer Foods Ezine.